Khanh ‘Kate’ Nguyen, Ph.D. student in mathematics, received a three-year NSF Graduate Research Fellowship.This fellowship, awarded based on Nguyen’s proposed research, comes with a three-year annual stipend of $34,000, as well as a $12,000 cost of education allowance for tuition and fees. Nguyen’s research, which is advised by Krešimir Josić, professor of mathematics in the College of Natural Sciences and Mathematics and Zachary Kilpatrick, assistant professor of applied mathematics at the University of Colorado Boulder, focuses on developing a decision-making model. “I want to know how the nervous system integrates incoming information with knowledge of changes to the environment,” Nguyen said. When making decisions, we have to constantly accumulate evidence of our surroundings, then decide whether this evidence is useful or if conditions have since changed. An example of this would be a predator moving into an area with lots of prey. As the predator eats this prey, the food supply becomes depleted. The predator keeps eating and eating, while food becomes scarcer and scarcer. At this point, the predator has to decide whether to stay in this area or leave for another place. This decision is made harder by the fact that the food supply is changing. These changing circumstances mean the predator has to make a decision based on incomplete information. With these decisions, there is a tradeoff between speed and accuracy. A quick decision yields a faster result but is less likely to be accurate, while a slow decision comes with the risk of conditions changing before the decision is made. “At the end, the reward is based on the number of correct choices with the time it took to make the decision,” Nguyen said. Nguyen started working in research as an undergraduate at UH. As a double-major in math and physics, she worked on models for spatial navigation, studying how rats can predict their position when running through a maze. This research was supported by the Summer Undergraduate Research Fellowship and the Provost’s Undergraduate Research Scholarship. 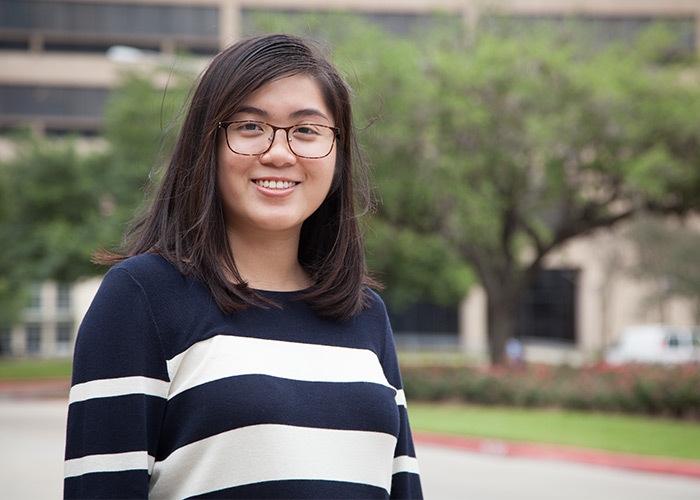 Based on the strength of her research, in her junior year of college, Nguyen was awarded the prestigious Goldwater Scholarship, which is awarded to college sophomores and juniors who intend to pursue research careers in the natural sciences, mathematics and engineering. Nguyen first learned about this scholarship from Donna Stokes, associate professor of physics, who encouraged her to apply.